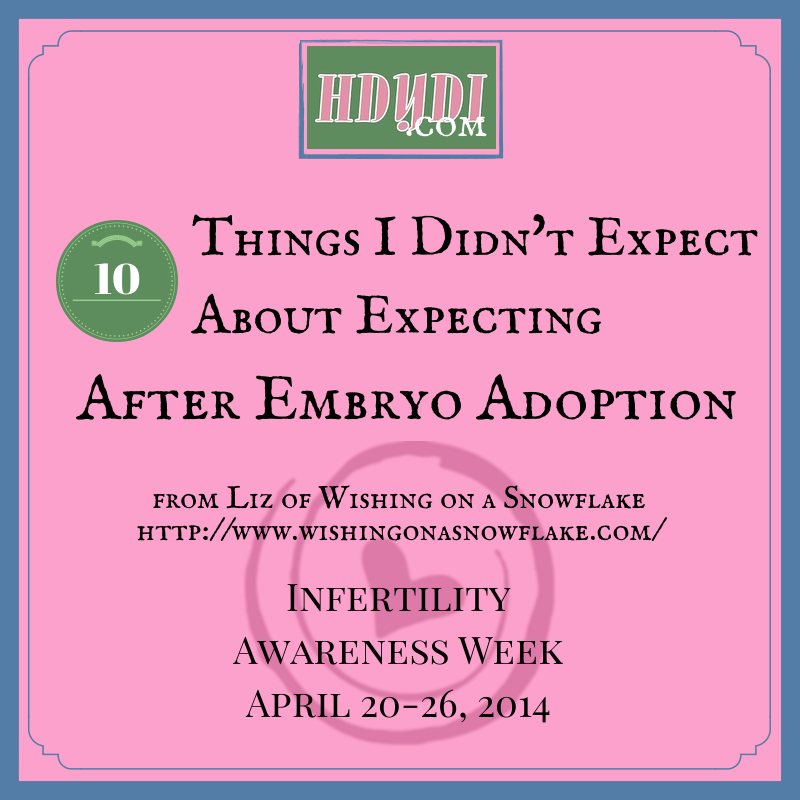 Liz’s Story, Continued: Finally Expecting After Embryo Adoption -- 10 Things I Didn’t Expect | How Do You Do It? Liz reflects on being pregnant, thanks to embryo adoption, after extended infertility. This post was originally published on her blog, Wishing on a Snowflake. I spent some time reading through my blog from my very first blog post back in 2012. I found myself thinking about all of the incredible things that pregnancy has brought me, much of which has surpassed my dreams. It was emotional going through some of the very dark posts, but doing so makes these wonderful moments today that much sweeter. It got me reflecting about some of the things I expected to happen and feel when I was pregnant, and how the reality turned out to be different in some cases. This isn’t a bad thing, just an observation about how I had no idea how the pregnant-me would feel in a lot of ways. Some of these are lighthearted, some are not. But NONE on this list are complaints – just reflections about how the reality of pregnancy isn’t what I had pictured it would be while dealing with infertility. I expected to live every day in fear. I really can’t believe this, but I’m not fearful. Sure, I have moments where I worry about Sammy surviving or that we might get some heartbreaking news. But it’s not gnawing away at me during every moment of every day like I pictured it would. I think that part of this is because I’m intentionally shoving any scary thoughts to the side and purposefully focusing on what we have today. I don’t live in the “what IFs”, I live in the “what AREs.” I’m only drifting my thoughts to the future if it’s in a positive way. I am grateful to God because my mental state is such a polar opposite compared to when I was trying to become pregnant. I expected I’d have lots of pregnancy-related complications by now. Before getting pregnant I had elevated blood pressure and insulin resistance. I am gluten intolerant and have MTHFR mutation. Heck, I even have a fairly rare infertility diagnosis and suffered two devastating miscarriages. I figured I’d always draw the unlucky card, even if I was lucky enough to get pregnant. Even believing that, I didn’t care and was willing to do whatever it took to bring a baby home. But to my surprise, I’ve had been blessed to have a very easy pregnancy. I know it’s not easy for everyone, and I acknowledge how hard it must be to have complications. I also know I’m not out of the woods yet. But I’m beyond grateful I’ve made it this far with nothing serious. I expected pregnancy to be full of cravings. I was sure I’d be chowing down rocky road ice cream, German chocolate cake, and would be sending Kevin to the store at 2 am for some calorie-ridden craving. I did not expect to have such a tumultuous relationship with food. Sure, I figured first trimester to be rough followed by insatiable, weird cravings in second and third trimesters. But overall, I just hate food even to this day. I really don’t have any cravings to speak of. Well, maybe chocolate milk but that’s about it. Everything else pretty much sounds like sawdust to me. I love to eat normally, so this surprises me. I expected to gain a bunch of weight from the above mentioned expected cravings. But in fact, I’ve actually lost a pound. I have a good explanation to this one, aside from the fact I hate food. I had some extra padding to begin with! Women with my BMI tend to gain less during than other women who are thinner. For what it’s worth, My OB isn’t worried whatsoever because I am making a point to get nutritious (usually liquid) calories down whenever I can. I’m surprised to learn that this is pretty common! I expected baby kicks to feel like butterflies fluttering or popcorn popping. They don’t feel that way to me at all. I have had GI issues most of my life and have had my share of intestinal spasms. And hands down, to me baby kicks feel like intestinal spasms. They are so similar that they are nearly indiscernible from them, but I know that’s not what they are. It doesn’t change the fact that I find them just incredible! I never expected to have a recognizable baby bump. I expected to just look fat, not pregnant. As mentioned above, I’m not a tiny chick with a tiny body. I’m 5’11” and have some padding. I expected I’d go through pregnancy with everyone wondering if I just ate too many cupcakes or burritos. That didn’t bother me too much, but I secretly coveted the ladies who had obvious baby bumps. I figured that would never be my reality. But I’m shocked and elated how much this belly has rounded out and is obviously full of baby. I’ve even had a couple of strangers approach me in public and ask me when my due date was! I’m proud of my body for finally being kind to me in an unexpected way. I expected my parents to be involved. Before infertility, I always pictured my mom and dad being involved and excited about my pregnancy. Then weeks after being diagnosed with DOR in 2011, my mom died of cancer. I didn’t expect that and it sent a ripple through my world. After years of treatments and now I’m finally expecting I hoped at least my dad would be involved. Sadly, this one isn’t true. For reasons far too long to list here, my dad is distanced. This is a sad realization for me and not what I expected. I expected to still have difficulty with others who had children the “easy way.” No doubt infertility has forever changed me. But I have genuinely embraced all things baby, regardless of how they came to be. I thought a future-me would perhaps be capable of that someday, but I had no idea how quickly. This makes me proud of myself because it scared me thinking I’d hold onto some difficult feelings for so long. I’m so glad to finally feel somewhat normal again. I never EVER thought I’d feel 99% normal during pregnancy. I expected to be an advocate for embryo adoption. But I had no idea how passionate I’d become. Becoming pregnant has lit a fire in me that is impossible to put out. I shout about EA from the rooftops whenever I can. I am working on ways to get the word out on it whenever possible. I give the elevator speech at any opportunity. I want to help others who want to know more. This is to a degree I never imagined and I feel fulfilled to a degree I never would have imagined either. I expected to love my baby, but I had absolutely no idea how much. I love her so much more than I ever thought was possible. I imagine every day what it will be like to hold her in my arms, to enjoy those gleeful moments on Christmas morning, and to have the soapy mohawks in the tub. I knew I would be in love, but my brain couldn’t comprehend it would be this much. And I’m sure I still have no idea to the degree I can ultimately love this little girl until I meet her and watch her grow. This post was submitted by Liz. Follow her inspiring story of pregnancy after infertility, embryo adoption, and loss at Wishing on a Snowflake. 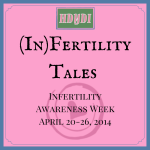 Pingback: Infertility Tales 2014: In Closing - How Do You Do It?